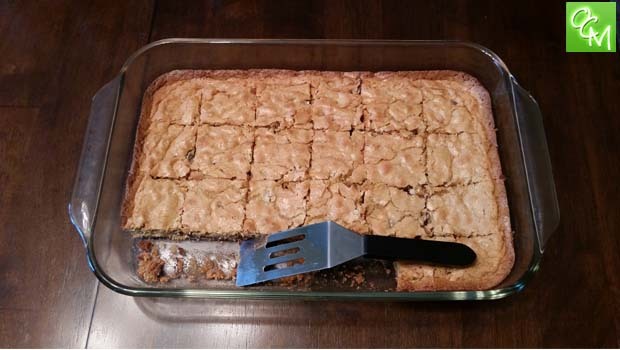 Gluten Free Chocolate Chip Blondies Recipe – recipe, ingredients, and directions for gluten-free blondie bars made with chocolate chips. My daughter has recently gone gluten free. I’m trying to ease the transition by keeping some tasty desserts and treats on hand. These came out awesome. My son (who doesn’t need to be gluten free) even loves them. In a medium bowl, mix the brown sugar, butter, eggs and vanilla just until blended. Add the gluten free flour, baking powder and salt; stir until combined. Mix in the chocolate chips. Spread the mixture into a greased 13-in. x 9-in. baking pan. Bake at 350° for 20-22 minutes or until a toothpick inserted in the center comes out clean. Cool. Cut into bars. Makes about 2 dozen 2×2 bars.